Summon: Destroy an enemy Undead. Dawnbreaker is a unique legendary Willpower item card. It is part of the Core Set. Dawnbreaker first appeared in Skyrim, and later reappeared in ESO. For historical information, see the lore article. Using the card's summon effect contributes towards The Dawnbreaker title, which in turn contributes towards The Treasure Hunter. Playing the card contributes towards the "Unique Cards Played" statistic. 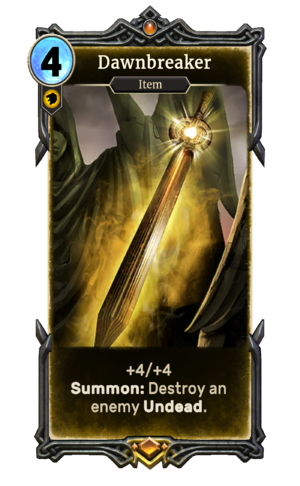 The card's art depicts Dawnbreaker as it appeared in Skyrim, in front of the Statue of Meridia.